A Weightlifting Program Gives Ex-Cons A Chance At Change It's not easy to go from prison back into regular life. Often, former inmates end up back behind bars. 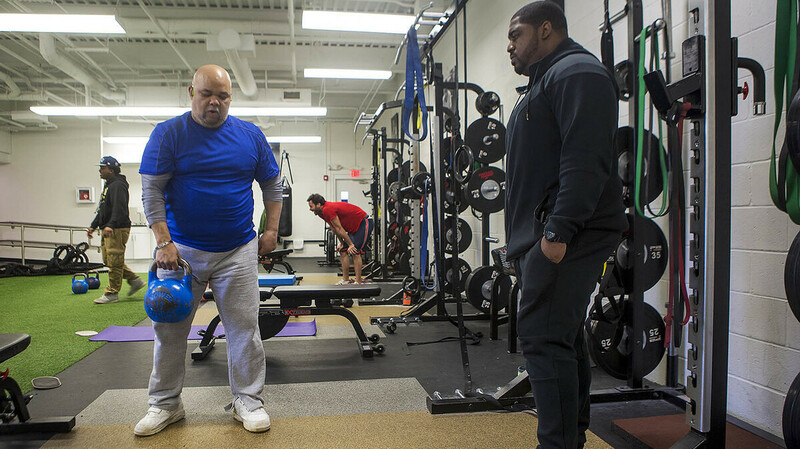 A Boston weightlifting program gives ex-cons and former gang members a job and hope for success. Read about innovators who take a business-like approach to solving social problems. After a couple of stints behind bars, Angel LaCourt (right) is now a trainer at InnerCity Weightlifting in Boston. Here he works with Bill Gramby, who recently had a stroke and is working out to build strength and stamina. It began with a simple idea: provide a safe place in Boston where ex-cons and former gang members can work out, find support and maybe even get a job. The result is InnerCity Weightlifting, a nonprofit also known as ICW that connects them with job training, workout clients and a chance at a new life. Just about all of the trainers have done significant time in jail. They've shot people and been shot at. Dan Royal grew up in Boston and was 11 the first time he was arrested on a shooting charge. "I got shot before that. My relative died right in front of my face. Also, I've been shot eight times. I've been shot once in the middle of my head, between my eyes. I've got two brain surgeries," Royal says. Royal is 36 and has been out of jail for three years. For that, he credits ICW, where he works as a personal trainer. It gives him an income and a network of support. "Dan is someone who I consider a close friend. I was also told not to work with him, as I've been told not to work with a lot of our students," says Jon Feinman, InnerCity Weightlifting's CEO. Feinman grew up in leafy western Massachusetts, a world away from the inner city. He ignored warnings that guys like Royal were too dangerous to work with. After college and a stint at AmeriCorps, Feinman founded ICW to help people break free of the cycle of crime and incarceration by teaching them to be personal trainers. It also gives potential clients a chance to connect with people like Royal. The program helps the trainers build what Feinman calls "social capital." For example, Jay Buchta, a business development executive who trains with Royal, says he helped Royal at his last court hearing by reaching out to a friend, a former prosecutor, and vouching for him. "And it turned out that my friend and the prosecutor of Dan's case had been office mates, so all of a sudden Dan had an association ... with someone who wasn't frightening to this attorney," Buchta says. Royal, who's off parole now for the first time in his adult life, says making friends with people like Buchta has given him hope — and a lot more. "Allowing me to see that everything isn't the way I thought it was, you know what I mean? Just thinking that a lot of people didn't care, or wasn't going to be anybody attempting to help you," Royal says. About 500 ICW clients have a chance to connect with these former inmates — and I've been one of them for more than a year. I work with a trainer named Angel LaCourt, who grew up in Roxbury, one of Boston's toughest neighborhoods. His mother was a drug addict and his dad was in prison when he started selling drugs at the age of 8. "All my friends' mothers was on crack. My friends' fathers were selling crack," LaCourt says. "They either got locked up, went to jail or mainly dead." Despite all of that, LaCourt became a high school football star and Boston College offered him a full scholarship. But then he shot and wounded a man, ended up in jail and lost the chance to go to college. When he came out, he went back to selling drugs again, was arrested and sent back to prison for 3 1/2 more years. LaCourt says he felt trapped in a system that offered no way out. "The day you get out of jail, you're coming home with nothing and you have to start from scratch. You can't get a job at some of these places when they see the criminal background," he says. "The only thing you want to do is, I'm going back to selling drugs. And that kinda gets people back into that same cycle: I'm failing, I'm failing, I'm failing. When am I going to succeed?" Four years ago, a friend brought LaCourt to ICW to work out, and he's been there ever since. ICW works with about 140 guys right now; some are certified to work as personal trainers like LaCourt, earning as much as $40,000 a year. When they arrive at ICW, recidivism rates are close to 90 percent. But for those who stay with the program that figure plummets to a tiny fraction of that. And staff members say they don't give up on anybody — even those who land back in jail. "Instead, we go and visit them in jail. We write them; see what we can do to support their families," says Mickey Belaineh, who helps run ICW. ICW plans to expand to Philadelphia next year, even though the staff is aware that a program designed in Boston for Boston might not work as well in other cities. But LaCourt says it can work anywhere there are too many drugs and guns and too few post-incarceration programs like InnerCity Weightlifting, which he says changed his life. "Yeah, it helped me out a lot. I think everybody needs to understand: All people need is opportunity, and everyone's willing to change with a little bit of hard work," LaCourt says.